The production day goal is to facilitate a stunning audio visual experience for your students or employees in attendance and to capture the presentation in digital format so that it can be reused and re-purposed later in multiple online and offline formats. At this point you may ask us to simply deliver the raw captured material to you for safekeeping thus ending our immediate scope of work. Or, you may ask us to continue the content development process with post production, and distribution services. Post production contemplates the further development of your content for later distribution in digital format. These services are driven by technological needs of your proposed distribution scheme. In essence, these services contemplate the following. The raw audio and video material needs to be edited and then rendered in the proper digital format depending on your ultimate distribution channel. The process from raw to final format requires the use of several software tools from one end of post production process to the other. Each tool has to be compatible with the each other tool, and has to readily "talk to" and otherwise agree with the other tools. More importantly, the tools selected should allow great flexibility in the ultimate distribution format. For example, assuming you choose to distribute only online now, a certain format would be selected for this outcome. But, what happens if you change your strategy in six months and decide to publish on DVD format for home use? Does your tool set support this change in strategy without undue effort? These questions must be answered by the design of the "tool chain" of software tools that are selected at the beginning of the post production process. 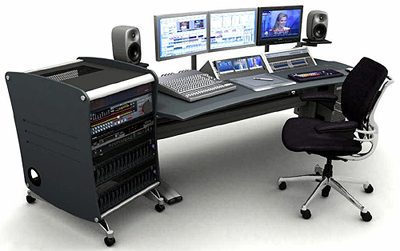 Using the tools that are selected, the raw audio and visual material obtained on the production day needs to be edited using those tools. The audio track is previewed, and sound artifacts are removed or corrected. Incorrect or inappropriate comments are removed and/or replaced. Topics discussed out of order can be re-arranged. Student questions can be clarified and then re recorded by another speaker after the live presentation and then inserted into the sound tract to improve the quality of the question that provoked your speakers answer. Similarly, if the presenter discusses a topic that was not on one of his Power point slides, that slide can be created and used after-the-fact. Bullet points not covered on a slide can be removed, or missing bullet points can be added. The point of the editing process is to make the recorded performance better than the experience of those who attended the classroom version. The audio component and the visual component needs then to be sequenced. This means that the slide that is shown needs to match the topics of the words that are spoken so that the audio matches the visual experience. In addition, "callouts" can be placed on each slide pointing to each bullet point at the correct time to simulate the effect of the live speaker pointing to parts of a slide with a laser pointer. All of this takes place using the editing software selected for use as part of the tool chain. After the raw material is cleaned up, and sequenced, the final product is digitally rendered into the final format. The final format need to be selected based upon the plan of distribution. For example, if the final product is intended to be an on line experience viewed over the Internet, the format might me a "flash movie" (SWF or FLV) file similar to what is used on YouTube.com and other online services. Each format has advantages and disadvantages. The task of format selection is formidable. This underscores the need to have a flexible tool set. If you choose a format, and then decide to render in another format, it would not be advantageous to go through the sequencing process discussed above a second time. The same tool should allow great flexibility in formats that can be selected for rendering. The post production goal is to end up with raw material that has been edited and sequenced so that it can be rendered in the most flexible number of digital formats. This will allow the educational content to be reused and re-purposed over time in a variety of distribution channels. The more alternatives and options that are preserved the better. Technology changes rapidly. Some can be anticipated, some cannot. Flexible tools, and good choices maximize alternatives and minimize the need to start over from scratch.